Minutes can be defined as the official record of the proceedings of a meeting or written record of what transpired in a meeting. Minutes are taken in order to prevent confusion and arguments over certain things that have been discussed at the previous meeting. Minutes are written in past tense because it shows already discussed agenda of a meeting. THE STRUCTURE OF A GOOD MINUTES. 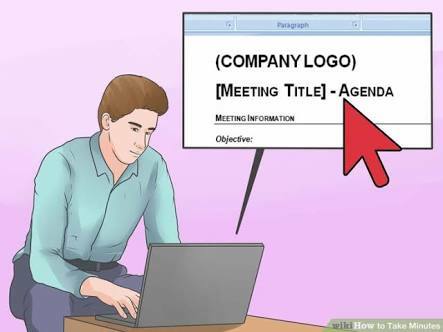 The title contains the name of the group that is meeting, the date of the meeting and the venue of the meeting. For example: Minutes of the Monthly Meeting of the Port Harcourt Youth Forum held on 20th August, 2016, at Port Harcourt Civic Centre. This is where you state the time and how the meeting commences. For example, "The meeting started at 5:00pm with an opening prayer by Mr Tammy Reuben." The record of the minutes should contain the names of the members who make up the group/organisation or were in attendance. Names of those absent with guinue reason(s). The attendance also registers those who are not members of the group/organisation but attended the meeting. This is an open discussion. Any comment or discussion that is not part of the agenda is called the Preamble. It contains speeches or remarks made, which are not part of the agenda. It states the fact that the minutes of the previous meeting were read. Having read the minutes, a person adopts it. This happens when the meeting held is actually not the first meeting held by the organisation. This has to do with the issues that may arise as a result of the minutes that was read. These issues may have to do with decisions that were made in the previous meeting. Any matter that arises as a result of the minutes that was read should be under matters arising. It could be a number of things or just one reason that the meeting is called. The substantive or new agenda is usually the new issues that are to be discussed. It has to do with issues aside the agenda of meeting, bothering any member of the meeting. Adjournment is the breaking of the meeting until later. After the agenda, somebody has to move for adjournment while another person seconds it. Subsequently, the secretary of the meeting writes when the meeting ends. Endorsement has to with the signature(s) that could be found on the minutes. This is done when all necessary corrections have been made, rewritten and typed. A good minutes should follow the above stated sequence in terms of structure.